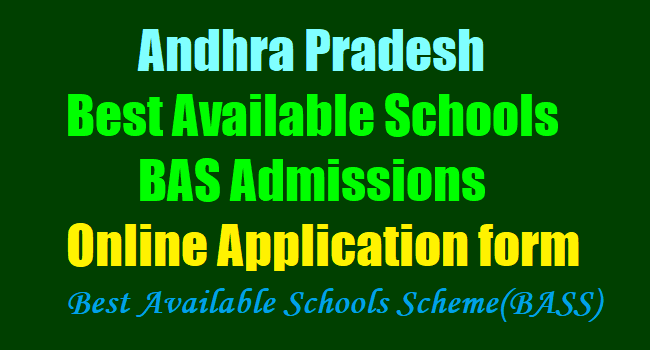 AP Best Available Schools(BAS) Admissions Online Application form 2018-19/ AP Best Available school scheme Admissions, AP BASS Admissions: Best Available School Scheme admission notification 2018: AP Best Available School Scheme Admissions notification 2018, Best Available School Scheme Selection notification 2018, #BASS admission test/entrance test would be conducted for this year: Tribal Welfare Department/Social Welfare Department would give the BASS Admissions 2018 notification in every year in March/April month for admission into 1st, 3rd, 5th, 8th classes for the academic year 2018-2019 and invites Online applications from the eligible students for admission into 1st, 3rd, 5th, 8th classes under #BASS. BAS Notification issued for selection of Schools under Best Available School Scheme for admissions into 1st and 5th Class only. Admit the 1st class student through Lottery system and in respect of 5th class student through written exam only. Best Available Schools entrance Test for 5th Class SC students under the Best Available School Scheme on 10.06.2018 at 10.00 AM. 3. Students Selections/ admission: 12.06.2018. 1. Objective: The objective of the scheme is to provide quality education to SC students by enabling them in reputed Best Available Schools from Classes I to X. 2. The entry point for admission is Class-V, in respect of Residential Schools and Class-I, in respect of Non-Residential Schools. 3. 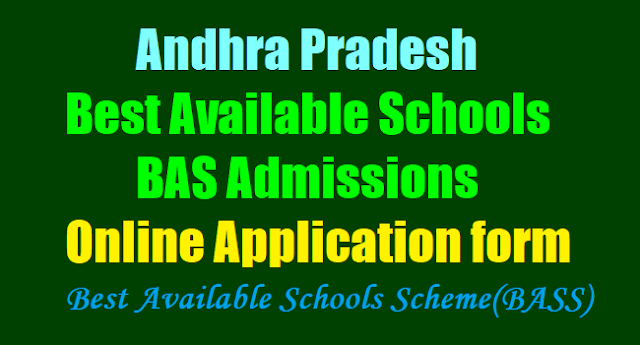 Admission into Class-I: Admission into Class-I (Non-Residential), the child should be born on or after 1st July, 2012 and on or before 30-06-2013. 4. Admission into class - V: Admission into class - V ( Residential), the child should be completed 4th Class during the Academic Year 2017 -18. If sufficient number of children are not available in any category, the same may be converted to other categories during that year only. 6. Annual income: Annual income of the parents should not exceed Rs.65,000/-- per annum in rural areas and Rs.75,000/- per annum in urban areas. 7. Only one child from one family shall be eligible for admission. 8. The admission of students under Best Available school scheme is restricted only to the district to which the applicant originally belongs. 9. Adoption deeds shall not be considered, if the natural parent I parents of the candidate are alive. 10. List of Documents: The following documents shall be submitted by the candidates at the time verification. • Date of Birth Certificate From Municipal Corporation /Municipal Board/ MRO/Thasildhar (or) Gram Panchayat. Could you please inform me when do you announced Best Available Schools results for Non residential schools of 1st class.